This article is brought to you by ShopBack. Not a single male in the world can ever bear to hear these words being directed to him by the object of his affections, and justifiably so, because it is a sign that he has been cruelly thrust into the FRIENDZONE. Urgh. As a male myself, I feel extremely sorry for my comrades who have lost all hope for any form of intimacy to bloom. So after you’ve ascertained the fact that you are indeed in the friendzone, what’s next? The sun’s still up, the world’s not ending yet and you’re not dead either. Life goes on. First things first: stop sulking. The rest of your life is still ahead of you, and how much you get out of it is dependent on your attitude towards it. Time to do something about your friendzoned status! Many guys tend to overcompensate with politeness in an attempt to become gentlemanly in the eyes of their crush. Rookie mistake. Stop ‘trying’ to be the nice guy. Be him. “What in the world does “Be him” mean, Tom?!? !” – You, the reader. It means, stop being someone you’re not and just be yourself! Quit fussing over whether you’ve been making the bestest impression you could conjure up every time you’re around her. Let the real you take control of your personality! Besides, isn’t this what it is all about? You want her to like you for who you truly are! When all is said and done, if she’s still not into you, then you know that she’s not the right one. Flirtatious behaviour is no doubt important during courtship. It’s the only mechanism that slowly progresses the relationship bit by bit. However, this takes a bit of finesse. If you and your crush are open to friendly, welcoming hugs, stroke the back of her head instead of thumping her awkwardly on her back. While walking next to her, make sure you accidentally brush against her. Have you tried being honest about your feelings to her yet? If not, why did you even consider yourself in the friendzone until she had verbally connotated the relationship as such? The fact is this: we don’t understand the female species. Their brains work in weird ways. Thus, until you’ve gone to make a move and attain an official response from her, you’ll never know whether it’s a friendzone or it’s her way of challenging you do put more effort into it. Tell her how you feel around her. Grab her hands and hold it like couples do. She’ll be in shock, but at least you’ll be able to figure out once and for all whether all hope is lost, or whether you just might have a chance. Bring her out on a date. Tell her it’s an official date, not an ‘outing’. #4: Face it, she’s just not into you. At the end of the day, if you’ve exhausted all your efforts and they still aren’t paying off, time to face the inevitable — she’s not into you, bro. You’re better off saving your efforts for another lady. But don’t be one of those guys. Even if you can’t develop the relationship intimately, it does not mean that you should cease all contact with her. You’ve led her on as a ‘brotherly’ figure and it is your responsibility to uphold that image. So be a good friend. #5: Broaden your social circle and meet new people. Trust me on this. If your supposed love is unrequited, the only thing you can do is to stop forcing it. It’ll never happen that way. The best thing you can do is to open up your social circle! Stop living in your own bubble, dude. Go on networking sessions, attend your friend’s birthday parties or install social dating applications on your phone! 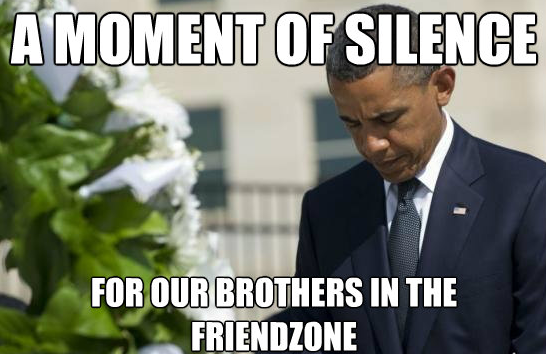 Friendzones are dreaded because they only ruin the person’s hopes for love, but please remember that it will never be the fault of the ‘friendzoner’. Don’t put the blame on her (or him)! There are a million instances of unrequited love happening every day, but don’t lose hope, there are always more options waiting for you. LunchClick is Singapore’s first female-centric dating app, developed by the dating experts behind the Lunch Actually Group, the biggest dating agency in South East Asia with over 10 years of proven track record. LunchClick is perfect for serious daters and singles looking to find love – we’re SDN (Social Development Network) accredited, and we manually approve all profiles to ensure that you only meet genuine & quality singles. No swiping, no chatting, just offline dates! What are you waiting for? Download the app on the Play Store or App Store today!